Aniket was the UNSW Medical Society Bookshop Director in 2009. He is in his final year of medicine, and is keenly interested in orthopaedics. 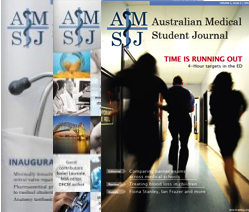 As medical students progress through their clinical years, they are exposed to the varied streams of medicine, which not only functions as a key component in their broader medical training, but serves as a degustation for potential specialities they may choose to pursue after medical school. Students often find themselves starting a specialty term without knowing what they need to know, let alone which is the best student-friendly textbook. The Oxford Handbook of Clinical Specialties (OHCS) is divided into twelve chapters, covering streams such as obstetrics and gynaecology, paediatrics, primary care, psychiatry and accident and emergency, which are part of the core teaching in most medical schools. It also covers a number of other important specialities, such as otolaryngology, dermatology, ophthalmology and anaesthetics. Made as a companion to the Oxford Handbook of Clinical Medicine – often referred to as the ‘medical student’s bible’ – this book is another in the Oxford Handbook series which provides a solid summary of many clinical streams that will be encountered by medical students as part of general medicine, as well as during speciality rotations. Like most books in the series, this book is extremely user-friendly. It is divided into different sections based upon fields, with coloured tabs used to help identify each section. Most chapters in the OHCS begin with summary pages which deal with the fundamentals of each stream, allowing students to familiarise themselves with the essentials and identify important learning areas. Following this, most chapters spend one or two pages discussing important clinical entities, covering the common, the classical and the critical conditions that medical students should be aware of. Students who have used other Oxford handbooks will be familiar with the structure used to discuss each condition. Where relevant, the book covers the basics – signs and symptoms, investigations, treatment and management, and complications. Where this book may fail students is in its lack of detail. While the succinct nature of the OHCS is useful in the first few clinical years, its brevity also means that the level of knowledge expected of more senior students is lacking. For example, the psychiatry section is an area where this textbook fails to compete with a more comprehensive text. Since psychiatry is a stream that is quite removed from the rest of medicine, the brief summary pages on schizophrenia and affective disorders will doubtless leave students wanting. The dermatology section is also underdone, with not enough space in this pocket-sized textbook to include images of the myriad of integumentary conditions, which is vital for the inexperienced student. Having said this, the OHCS certainly does not purport to be a comprehensive textbook of each of the streams it covers. Tutors will recommend their favourite textbook – the ‘must have’ for each speciality – which will serve to work biceps as much as brains. Like most Oxford handbooks, the selling point for OHCS is that it can fit in one’s pocket and is a handy guide to confirm what has already been learned. Overall this is a great textbook for junior-year students entering the clinical environment for the first time, and a useful reference text for senior students. 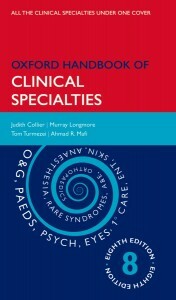 Collier J, Longmore M, Turmezei T, Mafi A. Oxford Handbook of Clinical Specialties. 8th ed. Oxford (UK): Oxford University Press; 2009.